How do I Make Aquarium Fish Grow Faster? Be careful about using live feeder fish as the primary food source for your fish. Feeder fish often aren’t kept in the best health, meaning any disease that fish may carry will be immediately passed onto your fish. Frozen fish food, pellets, and flakes are much safer options. In the natural world, healthy fish grow faster and larger than unhealthy fish. Your aquarium is no exception. There are a few important things to consider when “growing” your fish, notably the fact that fish (unlike some other animals) don’t get bigger by eating more. Overfeeding your fish is the leading cause of water contamination, fish disease, and death in an aquarium. Additionally, aquarium size has no impact on the potential size of your fish. Instead, fish will grow only as large as their genetics, hardiness, and health will allow. Give your fish the largest aquarium you can afford. While this won’t make the fish “fill out” a large aquarium, it will minimize overcrowding and dangerous nitrite levels. Change the water once a week. A 25% weekly water change should remove toxins from the water. Test the water weekly for pH levels. The optimal pH level for your aquarium depends on the type of fish you own. Maintain the appropriate water temperature for the type of fish you own. Vary your fish’s diet on the basis of its needs. Some fish need more protein than others, but all fish benefit from variation in food. Feed your fish sparingly. One small pinch of food a day is usually plenty. 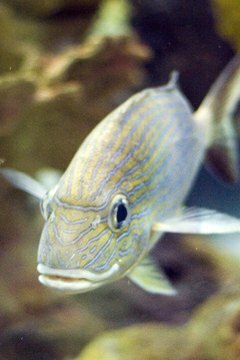 Excess uneaten food gets trapped in the aquarium and contributes to poor water quality. Complement your fish’s diet with a high-quality hormone-rich food, but only if the previous suggestions don’t work. First Tank Guide: How big will my fish get?